I'm working on a stencil (drawn in Illustrator which will be laser cut into stencil board) and was hoping to get some feedback on my work so far since I'm still really new to lettering. 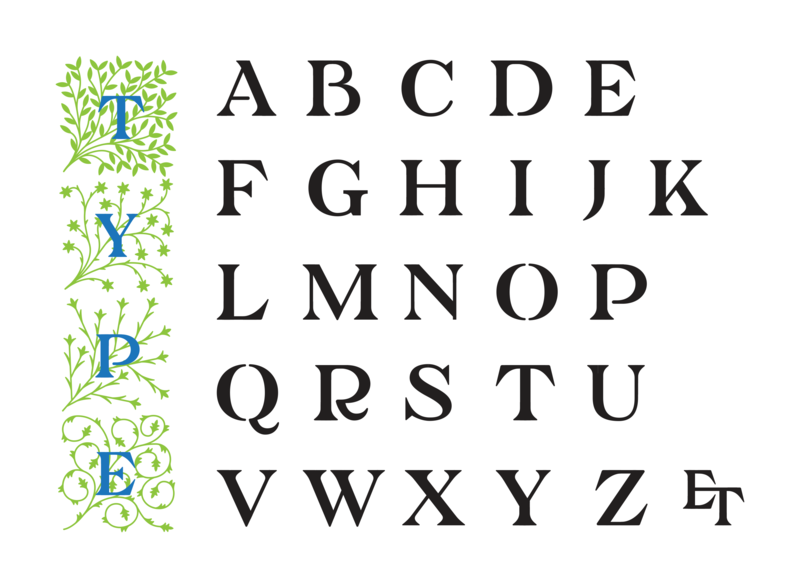 My alphabet is based on work by William Morris but I've tried to give it a modern twist. I've also drawn florals to be printed behind each layer to ultimately create a two-colour stencil print. Any feedback whatsoever is appreciated! Stencil I created last year, for reference on how the letters will ultimately be used. The point of the Kelmscott Press was to do the opposite of contemporary book and type design. Morision reviled and vilified the modern letter. The two styles are almost polar opposites within the continuum of serifed types. So mixing them requires much forethought and subtlety. Your alphabet looks like capitals chosen at random from Kelmscott, the Bruce Foundry, and Atkinson. You need to put more thought into what features matter from each style and then apply them consistently throughout the design. I think if you test with words using those letters, you can make minor adjustments and it'll work. I don't know if I'd go around calling it based on William Morris but I feel like it would be along the lines of what I think you were going for. The vertical O stress doesn't fit at all. Be careful that your modern twist doesn't rationalize all the good stuff away. Steer clear of trends in period mainstream type such as the look-at-me R and the top heavy P. I think you should exercise restraint on the R. It's the most tempting letter to go a little nuts with but you've got to reign it in. Once you've got that, I think you can work on the other letters, one at a time in context and get them to harmonize. Your new R will give you some clues for your B. The penny farthing thing has to go... that doesn't fit at all. Though you might not need them technically, I'd consider adding some stencil breaks to the letters with almost-closed counters like /K and /W, for consistency's sake. Thank you Ray and Craig, that was really helpful feedback. I'll start working on the corrections right away. And Ray, you couldn't be more right with the 'penny farthing thing,' I laughed out loud at the accuracy of your comment--working for a couple days without a break on this student project made me blind to some really obvious oddities in the letters. Despite perhaps not being exactly what you want to hear, @James Puckett’s feedback is what you need to hear. Rebecca, I think what you've begun is better than has been made out here, but it's also very unusual. William Morris was involved with the design of three types: the Golden, a roman after Jenson, and two blackletters, the Troy and the Chaucer. What you based your design on is not one of Morris's types, but the engraved roman title page lettering engraved in wood by William Hooper, the man who engraved all of the Kelmscott Press decorative work and Burne-Jones's illustrations. Morris often sketched these titles pages in rough, leaving Hooper to interpret them. 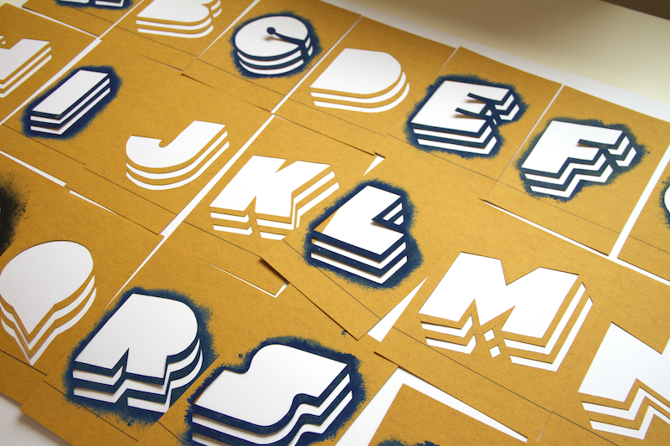 The resulting style is what one might call "heterodox," with elements of "modern" letters. Morris wasn't such a purist, after all. There have been interpretations and copies (of varying quality) of Morris's types for over a century, but I don't recall anyone paying attention to the title page lettering, as you have. You should keep in mind that what you're interpreting is not type, but lettering that was drawn, then engraved on wood. As was suggested above by Ray and Craig, you'll have to regularize the forms to one degree or another to make a useful font, but you might want to include some alternate forms, too. The letters are big and heavy, which will make them handy for certain things. Good luck!